The Adonit Mini 3 is the latest updated model of the Jot Mini series of stylus from Adonit. Shown in the picture above from top to bottom are Adonit Jot Pro, Adonit Switch, Mini 3 and Snap. The first three have the disc tips. Adonit Snap is a digital stylus, battery powered, and has the 1.9mm tip. The Adonit Mini 3 is also one of three styluses from Adonit that uses the disc-type tip. Mini 3 is basically the smaller version of Jot Pro. And Switch is the 2-in-1 version of Jot Pro with a built in ballpoint. Compared to the other disc tips, the one on the Mini 3 does not have that springiness, hence is firm and does not retract when you press hard. In actual use, the extra springiness feels nice but doesn't really have significant impact on the lines it can create. It's rather cool that the pen clip is cut into the body. The cap is the click-on type unlike the screw-on type of the other two styluses. The rubber on the body will hold onto the cap. The cross section of the stylus is triangular and the corners are all beveled and smoothed off. It's nice to hold. The stylus, even if it's called Mini, is actually of a good length when you put the cap behind. Having the disc tip allows you to see the lines below the ball tip. Capacitive stylus usually require large tip to function properly on tablet screen. The transparent disc design works because it still has a large surface area in contact with the screen, and the transparent disc allows you to see through to the lines beneath. Because this is a capacitive stylus, it will work with Android, iOS and Windows tablet devices. This is an extremely accurate stylus. The lines always appear directly beneath the ball. Be careful not to drop the stylus. I dropped the stylus once and the disc dislocated and had to spend a long time trying to find that small transparent disc on the floor. One question I get quite often is whether the disc will scratch the screen. The plastic is not hard enough to scratch the screen. However, if there's some particle that gets between the disc and the screen, then there could be scratches. These styluses sell by the thousands, you can just check Amazon for reviews from people who complain about scratches. The disc tip is actually not the best type of tip for writing. When writing, the tip is raise up and down numerous time. The disc may change to a different position, a position that's not easy for the disc to lay flat against the screen. So sometimes, I have to manually adjust the disc. In short, it does not write as fast compared to small hard point tips. Overall, it's a good stylus for artists who want to sketch with it. The build quality is excellent, and it's very accurate. But because it's a capacitive stylus, it has no palm rejection or pressure sensitivity. Having no palm rejection is not really an issue if you're using the stylus on a phone or small tablet. But when used with a big tablet, there's a tendency to rest the palm so it's more convenient to have the palm rejection feature. Not a deal breaker though. 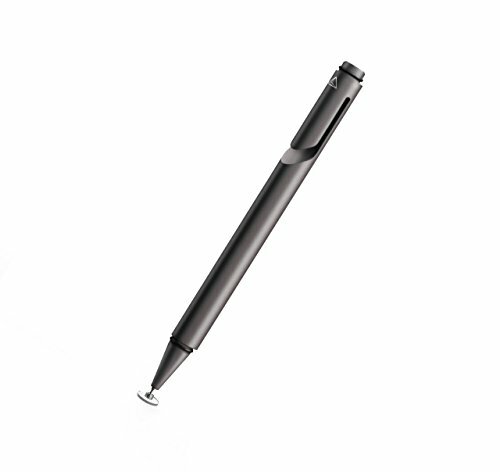 This stylus is actually more suited for Android and Windows tablet users. If you're using iOS, there are styluses with palm rejection and pressure sensitivity features, such as the Adonit Pixel. As a capacitive stylus, it's slightly more pricey compared to other styluses. But the disc tip and the build quality, in my opinion, still makes this a purchase that's worth the money. It does not need battery. And it should work with the Samsung E tablet. I have the adonit Jot mini. I've had it a long time. The color is dark pink. It has a round lid, not triangle looking lid, like the sample, above. I only want a little clear plastic, for the tip. I believe our 3 yr old grandson, must have lost it, when he played with it for a few minutes, near me. I would love to get a replacement, for it. Can you tell me how to get the little tip. I use the Jot mini with my iphone and ipad. Would like to use the Jot mini, again. is it slippery on glass? On a scale of 1 to 5 where 5 is slippery, this is probably a 3.5 or 4.